This landmark publication from Routledge reflects the widespread recognition of Childhood Studies as a significant and mature area of cross-disciplinary study and research. And as serious scholarly work in and around Childhood Studies blossoms as never before, this new four-volume collection from Routledge’s acclaimed Critical Concepts in the Social Sciences series meets the need for an authoritative reference work to make sense of a rapidly growing and ever more complex corpus of literature. With contributions from a broad range of disciplines (including Sociology, Social Policy, Social Work, Education, Anthropology, Cultural Studies, History, Geography, and Law), Childhood Studies assembles the key theoretical and empirical major works in a ‘one-stop’ resource. It covers themes such as: generational relations; everyday lives; practice and participation; and children’s rights and their place in the world. The collection shows how Childhood Studies has widened its focus from developmental issues to the broader concerns of children in society, as actors and agents, and as subjects of policy intervention. Edited by a leading scholar, Childhood Studies is an indispensable resource for all those concerned with the study of children and childhood. Phillipe Ariès, ‘Conclusion: The Two Concepts of Childhood’ and ‘Conclusion’, in Centuries of Childhood: A Social History of Family Life. Translated by Robert Baldick. (London: Penguin, 1962), pp. 128-133 and pp. 411-415. Alan Prout and Allison James, ‘A New Paradigm for the Sociology of Childhood? Provenance, Promise and Problems’, in A. James and A. Prout (eds. ), Constructing and Reconstructing Childhood: Contemporary Issues in the Sociological Study of Childhood. (London: Falmer Press, 1997), pp. 7-33. 3. Martin Woodhead, ‘Reconstructing Developmental Psychology: Some First Steps’, Children & Society, 13, 1, 1999, pp.3-17. 4. Pia Christensen, ‘Childhood and the Cultural Constitution of Vulnerable Bodies’, in A. Prout (ed. ), The Body, Childhood and Society. (London: Macmillan, 2000), pp. 38–59. 5. E. Kay M. Tisdall, ‘The Challenge and Challenging of Childhood Studies? Learning from Disability Studies and Research with Disabled Children’, Children & Society, 26, 3, 2012, pp. 181–191. 6. Anne Higonnet ‘Picturing Childhood in the Modern West’, in P. S. Fass (ed. 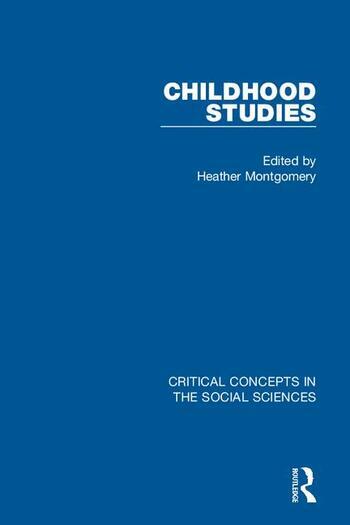 ), The Routledge History of Childhood in the Western World. (Abingdon, UK and New York: Routledge, 2012), pp. 296-312. 7. Anneke Meyer, ‘The Moral Rhetoric of Childhood’, Childhood, 14, 1, 2007, pp. 85–104. 8. Emma Uprichard, ‘Children as ‘Beings and Becomings’: Children, Childhood and Temporality’, Children & Society, 22, 4, 2008, pp. 303-313. 9. Leena Alanen, ‘Explorations in Generational Analysis’, in L. Alanen and B. Mayall (eds. ), Conceptualizing Adult–Child Relations. (London: Routledge Falmer, 2001), pp. 11–22. 10. Berry Mayall, ‘Intergenerational Relations: Embodiment over Time’, in L. Alanen, L. Brooker and B. Mayall (eds. ), Childhood with Bourdieu. (Basingstoke: Palgrave Macmillan, 2015), pp. 13-33. 11. Judith Ennew, ‘Time for Children or Time for Adults’, in J. Qvortup, M. Bardy, G. Sgritta and H. Wintersberger (eds. ), Childhood Matters. Social Theory, Practice and Politics. (Aldershot: Avebury, 1994), pp. 125-144. 12. Jo Moran-Ellis and Susan Venn, ‘The Sleeping Lives of Children and Teenagers: Night-Worlds and Arenas of Action’, Sociological Research Online, 12, 5, 2007, http://www.socresonline.org.uk/12/5/9.html. 13. Sharon Stephens, ‘Children and the Politics of Culture in "Late Capitalism"’ in S. Stephens (ed. ), Children and the Politics of Culture (Princeton: Princeton University Press, 1995), pp. 3-24. 14. David Oswell, ‘Five Myths of Childhood Studies’, in D. Oswell, The Agency of Children. From Family to Global Human Rights. (Cambridge: Cambridge University Press, 2012), pp. 263-280. 15. Nick Lee and Johanna Motzkau, ‘Navigating the Bio-Politics of Childhood’, Childhood, 18, 1, 2011, pp. 7-19. 16. Karen Wells, ‘The Politics of Life: Governing Childhood’, Global Studies of Childhood, 1, 1, 2011, pp. 15-25. Part 4. Childhood and Childhood under Threat? 17. Neil Postman, ‘The Disappearance of Childhood’, Childhood Education, 61, 4, 1985, pp. 286-293. 18. Mary Jane Kehily, ‘The Future of Childhood: Crisis, Cyclical Concern or Accommodation?’, in M-J. Kehily (ed. ), An Introduction to Childhood Studies, 2nd edition. (Maidenhead: Open University Press/McGraw Hill, 2008), pp.198-208. 19. Danielle Egan and Gail Hawkes, ‘Sexuality, Youth and the Perils of Endangered Innocence: How History Can Help Us Get Past the Panic’, Gender and Education, 24, 3, 2012, pp. 269-284. 20. Joel Best, ‘Fears and Folklore’, in Threatened Children: Rhetoric and Concern about Child-Victims. (Chicago: Chicago University Press, 1990), pp 131-150. 21. Nancy Scheper-Hughes and Howard F. Stein, ‘Child Abuse and the Unconscious in American Popular Culture’, in N. Scheper-Hughes (ed. ), Child Survival: Anthropological Perspectives on the Treatment and Maltreatment of Children. (Dordrecht: D. Reidel, 1987), pp. 339-358. 22. Patricia Holland, ‘Crybabies and Damaged Children’, in What is a Child? Popular Images of Childhood. (London, Virago, 1992), pp. 143-159. 23. Erica Burman, ‘Innocents Abroad: Western Fantasies of Childhood and the Iconography of Emergencies’, Disasters: Journal of Disaster Studies and Management, 18, 3, 1994, pp. 238-253. 24. Jo Boyden, ‘Childhood and the Policy Makers: A Comparative Perspective on the Globalization of Childhood’, in A. James and A. Prout (eds. ), Constructing and Reconstructing Childhood: Contemporary Issues in the Sociological Study of Childhood. (London: Falmer Press, 1997), pp. 190-209. 25. Helen Penn, ‘The World Bank’s View of Early Childhood’, Childhood, 9, 1, 2002, pp. 118-132. 26. Olga Nieuwenhuys, ‘Global Childhood and the Politics of Contempt,’ Alternatives: Global, Local, Political, 23, 3, 1998, pp. 267-289. 27. Sarada Balagopalan, ‘Constructing Indigenous Childhoods: Colonialism, Vocational Education and the Working Child’, Childhood, 9, 1, 2002, pp. 19-34. 28. Kathryn M. Anderson-Levitt, ‘The Schoolyard Gate: Schooling and Childhood in Global Perspective’, Journal of Social History, 38, 4, 2005, pp. 987-1006. 29. Nicola Ansell and Lorraine Van Blerk, ‘Children’s Migration as a Household/Family Strategy: Coping with AIDS in Lesotho and Malawi’, Journal of Southern African Studies, 30, 3, 2004, pp. 673-690. 30. Harriot Beazley, ‘Multiple Identities, Multiple Realities: Children who Migrate Independently for Work in Southeast Asia’, Children’s Geographies, 13, 3, 2015, pp. 296-309. 31. Tobias Hecht, ‘In Search of Brazil’s Street Children’, in C. Panter-Brick and M. Smith (eds. ), Abandoned Children. (Cambridge: Cambridge University Press, 2000), pp. 146-160. 32. Michael Bourdillon. ‘Children as Domestic Employees: Problems and Promises’, Journal of Children and Poverty, 15, 1, 2009, pp. 1–18. 33. Phillip Mizen and Yaw Ofosu-Kusi, ‘Agency as Vulnerability: Accounting for Children’s Movement to the Streets of Accra,’ Sociological Review, 61, 2, 2013, pp. 363-382. 34. Kristen E. Cheney, ‘Seen But Not Heard: African Orphanhood in the Age of HIV/AIDS’, in M.O. Ensor (ed. ), African Childhoods: Education, Development, Peacebuilding, and the Youngest Continent. (New York: Palgrave Macmillan, 2012), pp. 95-108. 35. Jill E. Korbin, ‘Cross-Cultural Perspectives and Research Directions for the 21st Century’, Child Abuse and Neglect, 15, Supplement 1, 1991, pp. 67–77. 36. Heather Montgomery, ‘Focusing on the Child, Not the Prostitute: Shifting the Emphasis in Accounts of Child Prostitution’, Wagadu, Journal of Transnational Women’s and Gender Studies, 9 (Spring), 2011, pp. 166-188. 37. Julia O’Connell Davidson, ‘Child Trafficking: Known Unknowns and Unknown Knowns’, in S. Wagg and J. Pilcher (eds. ), Thatcher’s Grandchildren. Politics and Childhood in the Twenty-First Century. (Basingstoke: Palgrave Macmillan, 2014), pp. 69-88. 38. David M. Rosen, ‘Child Soldiers, International Humanitarian Law, and the Globalization of Childhood’, American Anthropologist, 109, 2, 2007, pp. 296-306. 39. Pamela Reynolds, ‘Neutralizing the Young’, in War on Worcester: Youth and the Apartheid State. (New York: Fordham University, 2012), pp. 161-182. 40. Andrew Dawes, ‘The Effects of Political Violence on Children: A Consideration of South African and Related Studies’, International Journal of Psychology, 25, 1, 1990, pp. 13-31. 41. Robert Van Krieken, ‘The "Stolen Generations" and Cultural Genocide. The Forced Removal of Australian Indigenous Children from their Families and its Implications for the Sociology of Childhood’, Childhood, 6, 3, 1999, pp. 297-311. 42. Filip De Boeck, ‘At Risk, As Risk: Abandonment and Care in a World of Spiritual Insecurity’, In J. La Fontaine (ed. ), The Devil's Children. From Spirit Possession to Witchcraft: New Allegations that Affect Children. (Farnham UK: Ashgate, 2009), pp. 129-150. 44. Gill Valentine, ‘Boundary Crossings: Transitions from Childhood to Adulthood’, Children’s Geographies, 1, 1, 2003, pp. 37-52. 45. William Corsaro, ‘"We’re Friends, Right?" Sharing and Social Participation in Kids’ Culture’, in We’re Friends Right? Inside Kids’ Cultures. (Washington DC: Joseph Henry, 2003), pp. 36-65. 46. Barrie Thorne, ‘Creating a Sense of "Opposite Sides"’, in Gender Play: Boys and Girls in School. (Buckingham: Open University Press, 1993), pp. 63-88. 47. Marjorie Harness Goodwin, ‘The Embodiment of Friendship, Power, and Marginalization in a Multi-Ethnic, Multi-Class Preadolescent U.S. Girls’ Peer Group’, Girlhood Studies: An Interdisciplinary Journal, 1, 2, 2008, pp. 72-94. 48. Cindi Katz, ‘Growing Girls/Closing Circles: Limits on the Spaces of Knowing in Rural Sudan and United States Cities’, in D. Hodgson (ed. ), Gendered Modernities: Ethnographic Perspectives. (New York: Palgrave, 2001), pp. 173–202. 49. Ofra Koffman and Rosalind Gill, ‘"The Revolution Will be Led by a 12 year Old Girl": Girl Power and Global Biopolitics’, Feminist Review, 105, 2013, pp. 83–102. 50. Diederik F. Janssen, ‘ "Where" "Boys" "Are": Co-Constructions of Maturities-Genders-Bodies-Spaces’, Children’s Geographies, 7, 1, 2009, pp. 83–98. 51. Debbie Epstein, ‘Boyz’ Own Stories: Masculinities and Sexualities in Schools’, Gender and Education, 9, 1, 1997, pp. 105-116. 52. Valerie Walkerdine, ‘Popular Culture and the Eroticization of Little Girls’, in H. Jenkins (ed. ), The Children’s Culture Reader. (New York:　New York University Press, 1998), pp. 254-264. 53. Bronwyn Davies, ‘The Sense Children Make of Feminist Stories’, in Frogs and Snails and Feminist Tales: Preschool Children and Gender. (Cresskill, N.J.: Hampton Press, 2003), pp. 43-69. 54. Viviana Zelizer, ‘Introduction’ in Pricing the Priceless Child. (New Haven: Yale University Press, 1985), pp. 3-15. 55. Paula S. Fass, ‘Childhood and Youth as an American/Global Experience in the Context of the Past’, in J. Cole and D. Durham (eds. ), Figuring the Future: Globalization and the Temporalities of Children and Youth. (Santa Fe: SAR Press, 2008), pp. 25-47. 56. Daniel Thomas Cook, ‘The Missing Child in Consumption Theory’, Journal of Consumer Culture, 8, 2, 2008, pp. 219-243. 57. Gary Cross, ‘Valves of Adult Desire: The Regulation and Incitement of Children’s Consumption’, in D. Buckingham and V. Tingstad (eds. ), Childhood and Consumer Culture. (London: Palgrave, 2010), pp. 17-30. 58. Elizabeth Chin, ‘Feminist Theory and the Ethnography of Children’s Worlds: Barbie in New Haven, Connecticut’, in H. Schwartzman (ed. ), Children and Anthropology: Perspectives for the 21st Century. (Westport: Bergin and Garvey, 2001), pp. 129-148. 59. David Buckingham, ‘Screening the Market: The Case of Children’s Television’, in The Material Child. Growing Up in Consumer Culture. (Cambridge: Polity Press, 2011), pp 184-203. 60. Jens Qvortrup, ‘School-Work, Paid Work and the Changing Obligations of Childhood’, in P. Mizen, C. Pole and A. Bolton (eds. ), Hidden Hands: International Perspectives on Children’s Work and Labour. (London: Routledge, 2001), pp. 91-107. 61. Marjorie Faulstich Orellana, ‘The Work Kids Do: Mexican and Central American Immigrant Children’s Contributions to Households and Schools in California’, Harvard Educational Review, 71, 3, 2001, pp. 366-390. 62. Samantha Punch, ‘Household Division of Labour: Generation, Gender, Age, Birth Order and Sibling Composition’, Work, Employment and Society, 15, 4, 2001, pp. 803-823. 63. Stuart C. Aitken, ‘Not Bad for a Little Migrant Working Kid’, Children’s Geographies, 8, 4, 2010, pp. 363-372. 64. Harry Hendricks, ‘Child Welfare: Ways of Seeing’, in Child Welfare. Historical Dimensions, Contemporary Debate. (Policy Press, Bristol, 2003), pp. 1-17. 65. Michael Wyness, ‘Children, Family and the State: Revisiting Public and Private Realms’, Sociology, 48, 1, 2014, pp. 59-74. 66. Nigel Parton, ‘Reflections on "Governing the Family": The Close Relationship between Child Protection and Social Work in Advanced Western Societies – the Example of England’, Families, Relationships and Societies, 1, 1, 2012, pp. 87-101. 67. Annette Lareau, ‘Social Class and the Daily Lives of Children. A Study from the United States’, Childhood, 7, 2, 2000, pp. 155-171. 68. Virginia Morrow, ‘Conceptualising Social Capital in Relation to the Well-Being of Children and Young People: A Critical Review’, The Sociological Review, 47, 4, 1999, pp. 744-765. 69. Gunilla Dahlberg, Peter Moss and Alan Pence, ‘Constructing the Early Childhood Institution. What Do We Think They Are For?’, in Beyond Quality in Early Childhood Education and Care: Postmodern Perspectives. (London, Falmer, 1999), pp. 62-86. 70. Philip Alston, ‘The Best Interests Principle: Towards a Reconciliation of Culture and Human Rights’, International Journal of Law, Policy and Family, 8, 1, 1994, pp. 1-25. 71. Michael Freeman, ‘Why It Remains Important to Take Children’s Rights Seriously’, The International Journal of Children’s Rights, 15, 1, 2007, pp. 5 –23. 72. Afua Twum-Danso, ‘Reciprocity, Respect and Responsibility: The 3 Rs Underlying Parent-Child Relationships in Ghana and the Implications for Children’s Rights’, The International Journal of Children’s Rights, 17, 3, 2009, pp. 415–432. 73. Nigel A. Thomas, Brian B. Gran　and　Karl C. Hanson, ‘An Independent Voice for Children’s Rights in Europe? The Role of Independent Children’s Rights Institutions in the EU’, The International Journal of Children’s Rights, 19, 3, 2011, pp. 429-449. 74. Hugh Cunningham, ‘The Rights of the Child and the Wrongs of Child Labour’, in K. Lieten and B. White (eds. ), Child Labour. Policy Options. (Amsterdam, Aksant Academic Publishers, 2001), pp, 13-26. 75. Tatek Abebe and Anne Trine Kjørholt, ‘Social Actors and Victims of Exploitation. Working Children in the Cash Economy of Ethiopia’s South’, Childhood, 16, 2, 2009, pp. 175-194. 76. Sharon Bessell, ‘Indonesian Children’s Views and Experiences of Work and Poverty’, Social Policy and Society, 8, 4, 2009, pp. 527-540. 77. Antonella Invernizzi, ‘Everyday Lives of Working Children and Notions of Citizenship’, in A. Invernizzi and J. Williams (eds. ), Children and Citizenship. (London: SAGE, 2008), pp. 131–141. 78. Myra Bluebond-Langner, ‘Mutual Pretense: Causes and Consequences’, in The Private Worlds of Dying Children. (Princeton: Princeton University Press, 1978), pp. 210-230. 79. Jason Hart, ‘Children and Nationalism in a Palestinian Refugee Camp in Jordan’, Childhood, 9, 1, 2002, pp. 35-47. 80. Roger A Hart, ‘Stepping Back from "The Ladder": Reflections on a Model of Participatory Work with Children’, in A. Reid, B. Jensen, J. Nikel and V. Simovska (eds. ), Participation and Learning. (New York, Springer, 2008), pp 19-31. 81. Harry Shier, Marisol Hernández Méndez, Meyslin Centeno, Ingrid Arróliga and Meyling González, ‘How Children and Young People Influence Policy Makers: Lessons from Nicaragua’, Children & Society, 28, 1, 2014, pp. 1-14. 82. Manfred Liebel, ‘Child-Led Organizations and the Advocacy of Adults: Experiences from Bangladesh and Nicaragua’, in M. Freeman (ed. ),　Law and Childhood Studies: Current Legal Issues Volume 14. (Oxford: Oxford University Press, 2012), pp. 92-103. 83. Alison Clark, ‘Ways of Seeing: Using the Mosaic Approach to Listen to Young Children’s Perspective’, in A. Clark, A-T. Kjørholt and P. Moss (eds. ), Beyond Listening: Children’s Perspectives on Early Childhood Services. (Bristol, Policy Press, 2005), pp. 29-49. 84. Priscilla Alderson, Joanne Hawthorne and Margaret Killen, ‘The Participation Rights of Premature Babies’, International Journal of Children’s Rights, 13, 1/2, 2005, pp. 31-50.